A reference to "Material Design 2" was noticed in a Chromium Gerrit commit back in February, which was made private soon after it was pointed out. 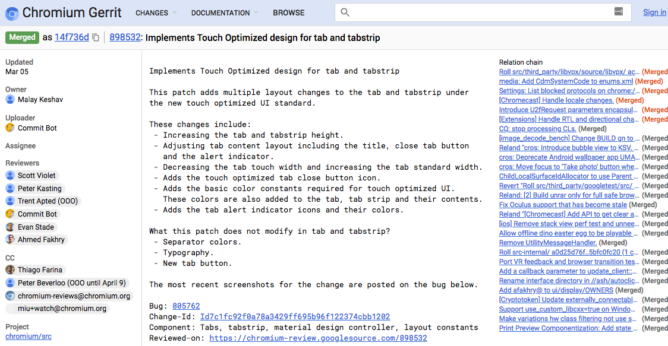 That commit has since been reopened to the public and has changed references to a Material Design update to mentions of a touch-optimized UI for Chrome. There is, however, a hint that Google plans to roll out a Material Design 2 refresh for Chrome on the browser's 10th birthday in September. The brief history of these updates has been documented by XDA Developers, which called out the first reference to Material Design 2 in February and recently noticed that commit was made public again. Mentions of "material design 2" were replaced by mentions of "touch optimized" UI changes. 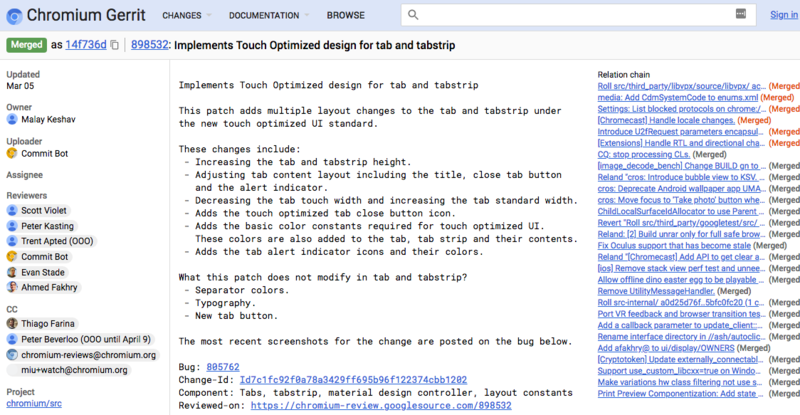 The updated commit now mentions "touch optimized" instead of "material design 2"
The commit notes changes to the Chrome tab and tab strip height, increasing the tab width, and adding a touch-optimized close button, among other things. 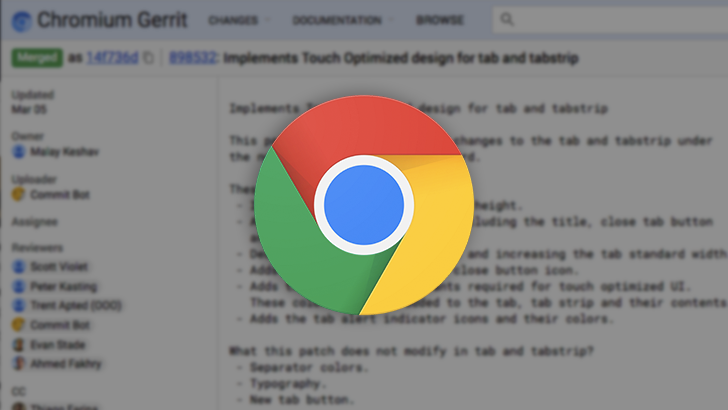 These can already be previewed by going to chrome://flags/#top-chrome-md and selecting "Touchable" in the latest builds of Canary or Chromium. Once you change the flag to "Touchable," the touch-optimized tweaks are apparent. (Note: You need to use a device with a touchscreen to see the changes.) Basically, things are a bit bigger, which makes sense if this is meant to make Chrome more friendly for tapping with fingers. The omnibox is also rounded, and the new-tab button is more pronounced. XDA also points out a comment on the commit while it was changed to private, which clarifies that this touch-optimized Chrome isn't a look at Material Design 2 (MD2) and that MD2 is "still being designed and won’t look like this in any case." Another comment asks if the colors are MD colors, and adds that "They’re not in the Chrome Birthday deck with the full-scale MD2 design." That seems to indicate that Chrome is getting an MD2 refresh on or around its 10th birthday, which falls on Sunday, September 2nd, 2018. A lot can change between now and September, but a touch-optimized Chrome makes a lot of sense if Chrome OS tablets are to become more of a thing. Let us know what you think of these changes.